LONDON -- Britain announced Wednesday it will expel almost two dozen Russian diplomats, sever high-level bilateral contacts with Moscow and take both open and covert action against Kremlin meddling after the poisoning of a former spy, plunging U.K.-Russian relations into their deepest freeze since the Cold War. 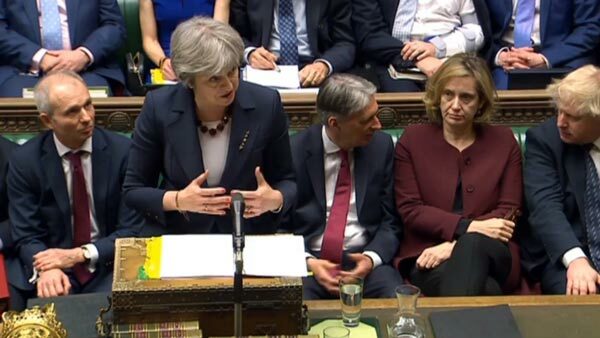 May spoke after Moscow ignored a midnight deadline to explain how a nerve agent developed by the Soviet Union was used against Sergei and Yulia Skripal. The father and daughter remain in critical condition in a hospital in Salisbury, southwestern England, after being found unconscious on March 4. May said Russia had provided no explanation, and "there is no alternative conclusion other than that the Russian state was culpable for the attempted murder of Mr. Skripal and his daughter." May also said Britain would clamp down on murky Russian money and strengthen its powers to impose sanctions on abusers of human rights - though she gave few details. "We will freeze Russian state assets wherever we have the evidence that they may be used to threaten the life or property of U.K. nationals or residents," May said, promising to use all possible legal powers against criminals and corrupt elites. "There is no place for these people - or their money - in our country," she said. The Russian embassy in London said the expulsion of diplomats was "totally unacceptable, unjustified and shortsighted." "All the responsibility for the deterioration of the Russia-UK relationship lies with the current political leadership of Britain," it said in a statement. Russian ambassador Alexander Yakovenko, said Britain's actions were "a provocation." Some Russia experts said the measures announced by May were unlikely to make Russian President Vladimir Putin's government change its behavior. She did not expel Russia's ambassador or announce sanctions against any individuals. "There does not seem to be any real appetite so far to investigate the ill-gotten gains of the Russian elite that have been laundered through London," said John Lough, an associate fellow in the Eurasia program at the Chatham House think-tank. "It is not clear to me that London's response will hit the Kremlin where it hurts." Moscow refused to comply with Britain's demands that it explain how Novichok - a form of nerve agent developed by the Soviet Union during the Cold War - came to be used in Britain. Russia said the U.K. must first provide samples of the poison collected by investigators. Putin spokesman Dmitry Peskov told reporters on Wednesday that Britain has offered "baseless accusations which are not backed up by any evidence." He said Russia would cooperate with the investigation but does not see Britain's willingness to reciprocate. Russia has claimed that the nerve agent could have come from another former Soviet country, pointing to Moscow's foe, Ukraine. Lawmaker Vladimir Gutenev, a member of the state commission for chemical disarmament, said Russia had scrapped its stockpile of Novichok. Britain has sought support from allies in the European Union and NATO, including the United States. May's office said President Donald Trump told the prime minister the U.S. was "with the U.K. all the way." European Council President Donald Tusk said Wednesday that the attack was "most likely" inspired by Moscow and announced he would put the issue on the agenda at an EU leaders' summit next week.